Made in the 1960's, by Swiza clocks from Switzerland. Stylish miniature brass cased alarm clock. Otherwise, it is in verygood condition with no splits, cracks or restoration. Available as shown swiza swiss made travel alarm clock. Leather case, working, ticking keeping time. Unsure about alarm functions, would assume the alarm works, as is. One of the hinges has come loose, other hinge fixture attached to clock is a bit loose. Little work needed to make it right, acceptable condition for its age. Payment appreciated within 3 days from auctions end. Shipping and handling will be 8.99. Boxed with plenty of secure padding. FREE Trial! LOOKS GREAT ON MY SHELF. Two fantastic novelty clocks, both European and despite their whimsical cases are both quality movements, mainly metal construction etc. one clock as you see is a guitar the second a painters palette complete with dried splotches of paint and a pair of brushes! This is made in Germany and marked Europa. The clock is missing a winding key s I was able to wind this up to get it working (it may just need a key or have further complications) The Guitar clock is a Swiss made SWIZA, a well known brand and well regarded among collectors. This one has an alarm which actually plays a wind up music box movement inside! This clock is winding well and keeping time etc, alarm works. Both clocks have their share of age related surface wear and tear- however as the pictures show both are presentable enough for a collection of vintage clocks. It's heavy made of pure copper. Keep in mind, color may vary slightly depending on viewing device. · Rare number face, in very good used condition, has light scuffs on casing. This is a working SWIZA travel clock with original box. ALARM WORKS. BRASS IS SOLID NOT PLATED. This item is marked Swiss Made on the inside. Color - Gold Tone. We are not experts. Item Details. Heavy little brass Swiza alarm clock, does not appear to be working, but could be very useful for parts. The brass case is tarnished and scratched, but could be polished. The glass, face and hands are in very good condition. Local pick up is available, just let us know if you want this option. Vintage Swiza Sheffield Battery operated Clock for parts or Repair Swiss Made. Condition is Used. Shipped with USPS Priority Mail. Swiza mignon. Windup Musical Alarm Clock. SWISS MADE. However, impressions may vary from person to person as well as color may vary from monitor to monitor. We will try our best to resolve the issues. Vintage "Swiza" Classic Design Brass 8 Day Alarm Clock for Repair. This is a beautiful clock! 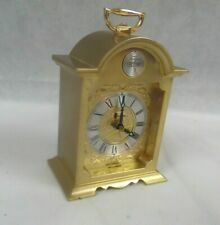 It's brass lantern styled clock has ornate decor around the top of the clock and nice floral type designs on each side. It has black hour and minute hands. The clock face reads Swiza and Swiss Made T.
Good vintage condition, please see pics to determine condition. Wear for the leather box, clock slides in and out of pins attached to the red box, connection to the red box is not secure, might use TLC. It keeps a good time. The outer box measures 3 by 2.5 inch. Fast shipping from NY. For sale is a SWIZA SWISS CLOCK in great condition with the box. From the heart of Jewelers Row in Philadelphia we bring to your doorstep authentic heirloom quality watches and jewelry. FREE Trial! Nice malachite finish around all the outside edges. This beautiful old clock is running as I write. Here is a recent Estate Find. 4 1/2" x 3" x 1 1/2". This is in Good Working Condition and The Alarm Works Too! This Will Make a Great Addition to Any Collection! This is Estate Fresh, Sold As Found, Don't Pass this one up! Brass lantern-type clock on its original onyx column base.The heavy brass case is in nice all round condition. The clock is approx. 2 7/8" Wide x 2 1/2" Depth x 5 1/2" High. (Very good cond. /working order, base is 4x4 x 1.5" / clock is 3" circular / light marks on glass and body, not too noticeable // slight wear marks under ball where it sits in the lucite cradle, tiny nick on back side as well ) -. Mid Century styling. In working condition. Product is important to us. discreet to insure your privacy. Here is a sweet Swiza brass alarm clock for sale. Measures approximately 4 7/8” long. Fully tested and is 100 percent functional. Great collectors item. There’s some light scratches and wear and the item is used so please buy accordingly. See all the photos. Free fast and always safe shipping! The clock is in working condition - looks great. COLLECTIBLES CLOCK ! The accuracy of the clock was checked for 48 hours and found to be accurate - sold as is. the exact one shown in the picture. Probably needs service to work propertly. Mid Century Swiza Very Rare Chrome Ball Desk Clock W Alarm In Clear Lucite Base. We can see why. The clock can sit without the acrylic base, though you probably won't want to separate this duo. Mid Century Swiza Very Rare! 4" (10cm) x 4" (10cm) square x approx. 1-1/2" () High. The clock is in very good working condition. This clock is original very nice item. The photos show the item which you will receive. I will do my best to identify all issues and note them in the ad. This nice clock is made in brass. The clock is in very nice working condition. The photos show the item which you will receive. ALL MADE IN BRASS - VERY HEAVY CLOCK. I will do my best to identify all issues and note them in the ad. The colour of the item could be slightly different from the photo because I am not a professional photographer. Heavy Solid Brass. WORKS perfectly! Weight: 700 gr. Width: 3' / 7,5 cm. The clock is in very good working condition. This clock is original and beautiful item. Genuine Leather outer Case. The colour of the item could be slightly different from the photo because I am not a professional photographer.